David Haardt | Rolleiflex TLRs. Rolleiflex is the most famous make of TLR (twin-lens reflex) cameras, i.e. on top you have a viewing lens with a fixed mirror and a screen (waist-level finder, but various prisms are also available), and below that a taking lens with a leaf shutter leading directly to 6x6cm roll film (see the figure at the right). The result is a rather compact, quiet and light-weight camera with no mirror blind during exposure and no mirror slap. The downside is fixed lenses (apart from the Mamiya TLR cameras), no depth-of-field preview, and parallax, i.e. the closer you focus, the more difference is between what you view with the viewing lens and what you will photograph with the taking lens. Franke and Heidecke of Braunschweig, Germany, the founders of Rollei, developed the original Rolleiflex, the concept of which should remain the main professional tool until the introduction of the medium format system SLR by Victor Hasselblad of Gothenburg, Sweden. TLR cameras are still being used by professionals and amateurs, especially by wedding photographers due to their flexibility and discreetness. The Rolleiflex 2.8FX is still being manufactured by Rollei, but only in rather limited numbers, and at a very high price. A few years ago, Rollei manufactured the 2.8GX, which has the same appeal as the 2.8FX. Basically, there are two different Rolleiflex TLR families, the 3.5 (75mm) and the 2.8 (80mm), which also let us know the maximum aperture of the taking lens. The models were named from A to F (actually only the 2.8 series was fully named like this, the earlier 3.5 series had different, non-systematic, names earlier on), so the 2.8F is the most recent model (apart from the 2.8GX already mentioned above). Some people believe that the f/3.5 lenses are a bit better than the comparable f/2.8 lenses, but obviously Rollei didn’t think so when they decided to resume 2.8 rather than 3.5 production. Of course the 2.8 cameras are more expensive and heavier than their 3.5 counterparts. In addition, there is the Rolleicord series which was designed as a budget line with comparable build quality but less bells and whistles and less extraordinary lenses. Lateron, the Rolleiflex T was introduced, closing the gap between Rolleiflex and Rolleicord. 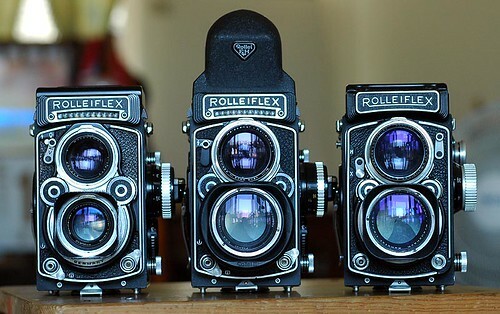 The Rolleiflex Baby cameras use (obsolete) 4x4cm (12 frames onto type 127) rather than 6x6cm (12 frames onto type 120 or 24 frames onto type 220) roll film. efke R100 127 is the only type 127 film still in regular production. There were five types of taking lenses used, which can be ranked in three quality groups: First, the Carl Zeiss Planar and the Schneider-Kreuznach Xenotar, which are the very best, second, the Carl Zeiss Tessar and the Schneider-Kreuznach Xenar, which are only a bit behind, third, the Carl Zeiss Triotar which is the budget lens but yet good. The Planar is almost identical to the Xenotar, the Tessar to the Xenar. While most people feel that the Carl Zeiss lenses are of the same optical quality as their Schneider-Kreuznach counterparts (some people believe that either one of the two manufacturers is a bit better), the reputation of the Carl Zeiss name has led to the fact that a Rolleiflex with a Planar is more expensive than a comparable one with a Xenotar, the same holds true for Tessar vs. Xenar. It should be noted that Carl Zeiss lenses on Rolleiflex cameras made for the Eastern European market were labelled “Opton” rather than “Carl Zeiss” due to the brand name issues between the original Carl Zeiss factory in Jena (former GDR, Eastern Germany) and the “Western” Carl Zeiss factory in Oberkochen (former FRG, Western Germany). Similar policies hold true for other Carl Zeiss products exported from West to East (i.e. 1949-1990 Hasselblad and Rollei SLR lenses, etc.) Vice versa, the products made by Carl Zeiss Jena for the non-communist world (e.g. 35mm lenses for Praktica cameras and medium format lenses for Pentacon cameras) were labelled “aus Jena” (“from Jena”) rather than “Carl Zeiss Jena”. All Rolleiflex/Rolleicord TLR cameras are limited to a single focal length, that’s why a Rolleiflex Wide (“Rolleiwide”, 55mm) and a Rolleiflex Tele (“Telerollei”, 135mm) model were introduced which are quite valuable today. There are also two converters available called Carl Zeiss Mutar (0.7x and 1.5x) which can be used on the regular Rolleiflex/Rolleicord models resulting in only slight quality loss (make sure to get the correct size, as they are both available in various Rollei Bay sizes).